Dream Pod 9: Dream Pod 9 Teams Up with Bundle of Holding Again for our Jovian Chronicles Fans! 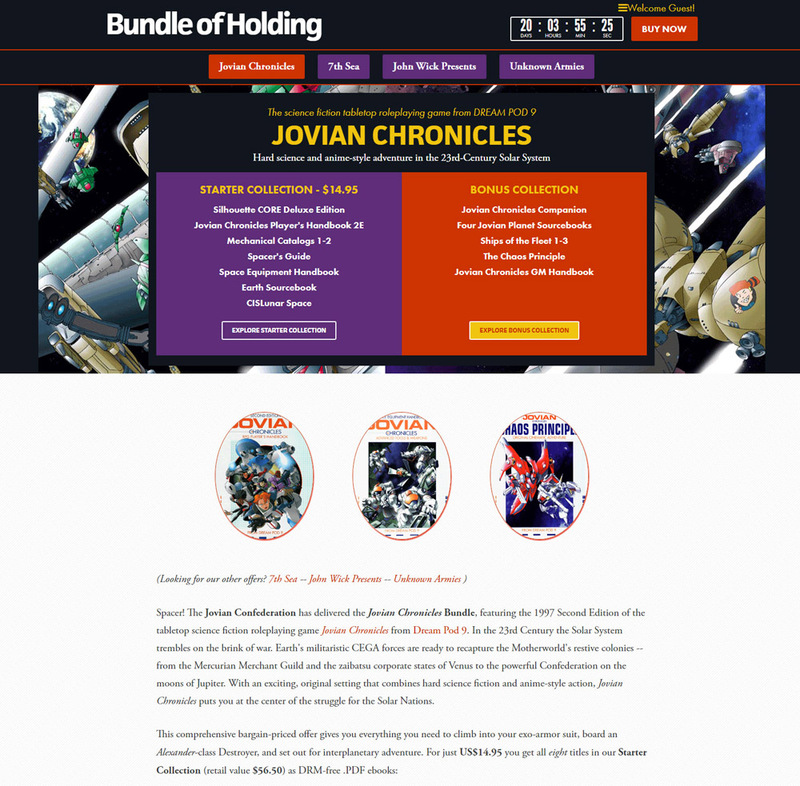 Dream Pod 9 and the Bundle of Holding website are pleased to announce the launching of a new Jovian Chronicles ebook Bundle offer. Jovian Chronicles is a hard science and anime-style adventure roleplaying game set in the 23rd-Century Solar System. The starter bundle at $14.95 USD includes a comprehensive collection of 8 ebooks featuring the 1997 Second Edition of Jovian Chronicles. Also a Bonus collection with 10 more ebooks is also available for an extra pledge. We are also happy to announce that ten percent of each purchase (after gateway fees) will be going to the Make A Wish International charity, which grants wishes to children with life-threatening medical conditions. The offer runs until Monday, April, 2nd, 2018. Here is a link to the page for all our fans of Jovian Chronicles, please be sure to share the post with friends to let them know about the Jovian Chronicles Bundle at a great price and support Make A Wish International at the same time. Home › Blogs › Robert Dubois's blog › Dream Pod 9 Teams Up with Bundle of Holding Again for our Jovian Chronicles Fans!